Water parks – the COOL PLACES to COOL DOWN! 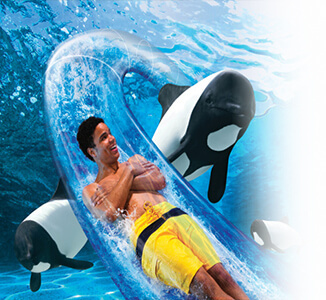 High-speed water slides and exhilarating wave pools, quiet beaches, and remarkable animal habitats are all to be found at Aquatica Orlando. This fabulous water park has it all. From extreme drops to wonderful tube rides alongside dolphins, there’s something to inspire awe and wonder into any kid – and it is not just the thrill of the rides to enjoy! This fabulous water park opened in May 2017, and is just steps away from Universal’s other theme parks and attractions. The water park has 4 immersive areas for thrills and relaxation. This place offers at least a days entertainment for the family! With 18 incredible attractions, you’ll be able to experience daring water adventures and moments of peaceful relaxation—all without having to worry about waiting in line or carrying around rafts. You’ll be granted the powers of the TapuTapu ™ wearable, which gives you more time to careen down slides, brave whitewater torrents, drift down a winding river or relax in your own waterside cabana. So the story goes that during one of Florida’s hurricanes – the ship that sits on top of the “Volcano” at the center of Typhoon Lagoon was washed up there and got stuck! Every hour the foghorn blows and a geyser of water erupts from the top – just like “Old faithful.” It’s a great place to spend a day with the family. Learn to chill out as you ride around the park in the lazy river, or take the awesome “Humunga Cowabunga” ride that propels you down an extreme slope at about 40 miles-per-hour (at least it feels that fast!). 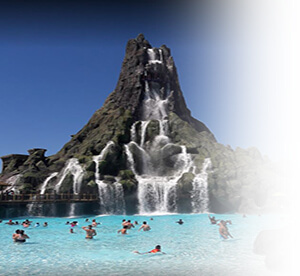 Disney’s Typhoon Lagoon Water Park features the largest inland surfing lagoon in Florida. For tots, there’s a lot. For teens, thrills like you have never seen. Everyone can hang ten, or take five in this tropical paradise. Disney built a ski resort here in Florida. Well, it melted – go figure! What remains is Disney’s Blizzard Beach Water Park. 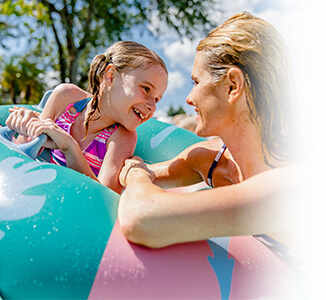 From bunny slopes to black diamonds, Blizzard Beach is packed with downhill thrills and plenty of ways to cold chill. This water park is guaranteed to keep you warm as the sun’s rays bounce off the “snow” white surroundings – so slap on plenty of sun-screen when you visit! 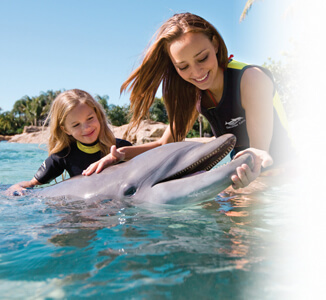 Voted The Best Theme Park in the world by TripAdvisor travelers in 2015, Discovery Cove® is an all-inclusive day resort where you can swim with dolphins, snorkel among rays and tropical fish, hand-feed exotic birds, come face-to-face with playful otters, and relax on pristine beaches.